"We got a bit lucky with the wind shifts but we sailed it really well," explained Peponnet. "We didn't do well in the second race though, so we will have to improve tomorrow." "We put a lot of energy into winning the World Championships," said Mion. "Unlike Aarhus, the goal here is not directly to win it. 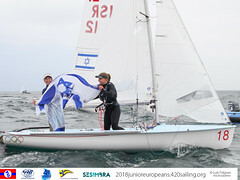 We want to gain a lot of experience from the Olympic venue, but if we have a lot of good races at the front of the fleet, then we'll have good confidence for the next couple of years as we build for the Olympics." Winning a medal on Olympic waters in advance of an Olympic Games is a strong indicator of what's to come, and the Men's 470 fleet is full of world-class competitors aiming for the podium. 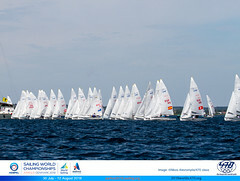 Japan's expertise in the 470 and knowledge of their home waters shone, with four teams in the top six after day one. Keiju Okada and Jumpei Hokazono (JPN) lead the way on seven points and are followed by Naoki Ichino and Takashi Hasegawa (JPN) and the French. 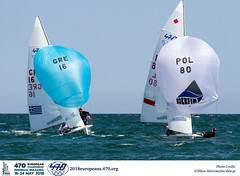 Japan's Ai Kondo Yoshida and Miho Yoshioka won gold in Aarhus but had a mixed day in the Women's 470 fleet today, yet were still able to find some form. Summarising the opening day, Dubbini commented, "After a bad start, we did well in the first race as we had a good downwind. In the second race we fought with the World Champions and we were first the whole time, but they managed to take the win. We're looking ahead to the next one."